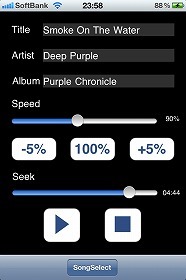 SCPlayer is a simple player that can play music to set the speed. Playing music can be selected from the iPod library. SCPlayer can change the playback speed, for example, or when it is convenient to use an instrument to practice. When you tap the button SongSelect, iPod library is displayed, you can choose the music. You can drag the slider of Speed, by tapping the buttons +10% to -10% or buttons can be changed from 0% to 200% playback speed. When you tap the button to 100%, the playback speed of 100% to return to normal speed.